Brighten your Bag is a road safety design competition which a school or local authority can hold to help promote road safety messages. It is themed around good visibility for pupils and encouraging them to consider how they are seen whilst travelling. Pupils are asked to design a ‘bright bag’ which can help them to be seen. They either add bright and reflective materials to a bag they already have or they can draw a design of a bright bag as a ‘paper entry’. Entries are judged by organisers and prizes can be presented in an assembly and then used for a display in school. If you are a teacher and just want to run the competition in your school you can do this on a smaller scale. Make use of the photos or drawings of the entries – they can make a great display for your active travel/road safety noticeboard. For the bright resources ask your school community to help you out – for example a parent or local business may donate unwanted high vis jackets which can be cut up into pieces of fluorescent and reflective materials. Use tin foil, neon marker pens and other household or classroom resources to make designs bright. Be open to different ideas… we’ve seen Christmas lights wrapped round bags for this competition which may not be practical for day-to-day use but pupils will get more out of it if you let their creative minds wander. Make sure you (or the schools you work with) collect evidence of your activity with photos etc so you can use it towards a school travel accreditation scheme such as TfL STARS (in London) or Modeshift STARS or your own local scheme. Use this activity alongside your other active travel/road safety education initiatives to make sure pupils learn about the key messages. Make sure prizes are relevant to the task and for the age group. This competition could be adapted for pre-schools but with different prizes. Promote the results of the competition to help raise further awareness of the key messages being taught and to help those messages to get back to parents and carers. 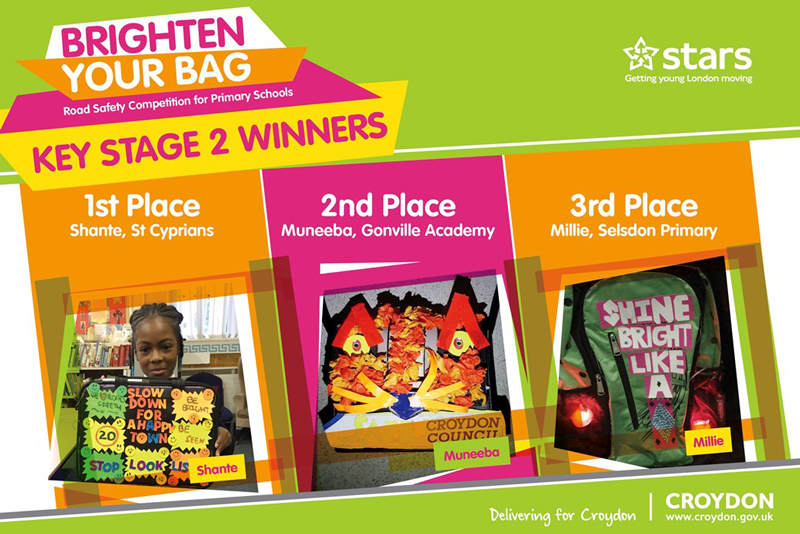 Schools in Croydon have been taking part in Croydon Council’s Brighten Your Bag competition for several years.